The Hearing Clinic has been serving the Southeast Louisiana and its neighboring communities for the past 20 years. Our friendly and caring staff are always ready to assist you with your hearing needs. We value education and continuous learning and believe that they are essential in providing our patients the best possible hearing healthcare. As such, our Audiologist has a doctorate degree in Audiology, the highest possible credential required to practice Audiology and hearing aid dispensing. Our expert regularly attends national and international conferences to ensure that the hearing healthcare we provide our patients are the most recent trends in the industry. We use state-of-the-art equipment in the evaluation, diagnosis, treatment and rehabilitation of hearing loss. We have access to several hearing aid manufacturers to determine which hearing instruments will be best suited for your needs. 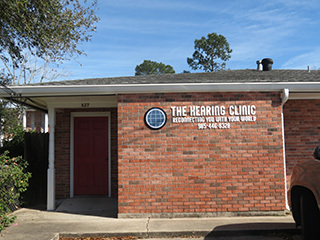 The Hearing Clinic, LLC is located at 527 Foret St. Thibodaux Louisiana in a Fourplex building on the corner of East 7th St and Foret. We are adjacent to an Orthodontist's clinic, Dr Donovan Sognet. It is near ED White Catholic HIghschool and Thibodaux Elementary School. From Canal St,Turn Right (if coming from Houma or Morgan City) or Left (if coming from Vacherie, Napoleonville or down- the- bayou ) on East 7th St. Drive 11 blocks. Then turn left of Foret St. The Hearing Clinic will be the second building to your right. The Hearing Clinic, LLC is open from Monday to Friday from 8:30 am to 2:30 pm by appointment only.